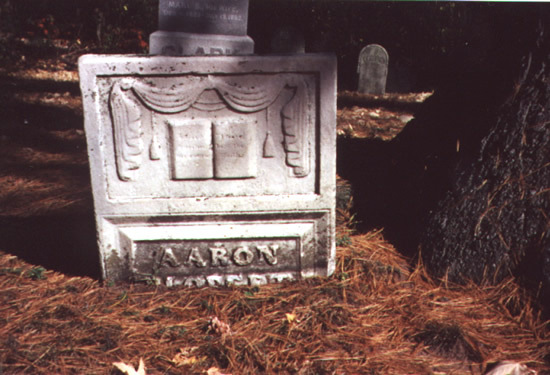 The individual whose history I now transcribe, from the dim data which has been found available, as traditional lore, garnered and laid up in the memory of his descendants and of those who were his cotemporaries, who lived and toiled with him in the early beginnings of settlement and civilization in "these ends of the earth," was a man of rare qualifications for the place which he had been fitted to fill in the history of this county. Indeed the history of Hounsfield could not be written without giving his name and his acts and doings such prominence as would tend to make him appear one of the pillars upon which the people relied in organizing their municipal affairs. He was the son of CALEB BLODGETT, and was born in Hampden, Hampshire County, Massachusetts, May 9, 1773. His father was a farmer, who managed to get a good living from a small farm of 50 acres of land, and to furnish facilities for his children to acquire such an education as to fit them for usefulness in after life. The subject of this sketch paid a good deal of attention to the science of numbers, and to the higher branches of arithmetic, in his school days; and acquired a good knowledge of practical surveying—an art which he practiced successfully in after life, and which was a source of profit to him. When he was old enough to ride on horseback, he was relied upon by the family as a market boy, to do the necessary marketing for them, and to make purchases of such little articles of ordinary use, from the retail stores and shops of merchants and mechanics, as were needed in the family, and to carry such things as butter, eggs, poultry—etc. etc., as small farmers had to spare. At one time when he was quite young he was sent with a quarter of mutton into the town, with instructions to purchase small narrow ribbon, called "taste" and some rice. He repeated his errand over to himself until he thought he was all right, but the horse ran away with him, and he lost his meat in the race, though he kept his seat on the horse's back, and finally controlled him by the time he got into town, where he proceeded to do his errands at the store, by enquiring for "tice and race"—instead of taste and rice, very much to the amusement of those who had been cognizant of the race he had just finished. When he was of a proper age he learned the carpenter's and joiner's trade, and the millwright business, of a Mr. CHAPIN. He was a very industrious young man, and made the most of his time, realizing with FRANKLIN, that time is money, and that if he would thrive he must husband his time as well as his money. It was on this principle that at one time, when he waiting a week for a job, he proposed to a poor man that he would work for him for his board and 1 dollar in cash, thus doing the man a very great favor, and saving the expense of his board, and earning a small pittance, instead of spending as much or more, which he would be likely to do if he was idle. It is also on this principle that we account for his success in life—making the most of his time and opportunities. But in this particular instance, he found himself richer at the end of the week, by a trade he made, by which he gained $15. While he was a young man he came to Oneida County; and let himself for the Summer to work, and then returned to Massachusetts. He built a powder mill in company with another man, and carried on the business of making powder and marketing it wherever he could find purchasers, among the country merchants in N.E. and in this state. The Indians were found to be good customers for his powder, at remunerating prices. While he was with the Oneida Indians at one time, and was indulging them in a trial of skill at shooting at a mark, his pistol burst and hurt his hand. The Indians manifested a good deal of sympathy for him, and the chief, HENDRICKS, sent a young member of his tribe into the woods to procure a certain herb, whose properties he seemed to understand. When it was procured, he bound some of it on his hand, and it healed very readily. The first time he visited them for that purpose, he traveled with a one horse team, but afterwards went with a two horse team. They were very glad to see him, and set about making a great feast, for which purpose they killed a large fat turkey, which had been kept for some such great occasion. The turkey was tolerably well dressed, and then dissected and thrown into a large camp kettle, and stewed, something as the white people fricassee a chicken. They had no salt, however, or other seasoning, and there-fore the taste was rather insipid, to a person who had been accustomed to eating highly-seasoned food; but nevertheless, he deemed it good policy to seem to enjoy the meal amazingly. They had provided a knife and fork for his special benefit. After a moment, however, he lay down the knife and fork, and imitating their example, proceeded to help himself with his fingers, saying; as he did so, "me Indian too." This settled the position he was to occupy in their good graces. He sold one of his horses to them, and then returned; leaving some powder with them to sell out for him. HENDRICK, the chief, frequently assisted him in selling his powder, going out to different places in the surrounding country with him. He had some pretty Indian ponies, one of which BLODGETT admired very much, and spoke of it being the prettiest he had ever seen; but the Indian assured him, that "me bring the other horses, you think it is this." HENDRICKS closed up the powder business honorably, sending the money which he had received for powder left on sale with him and sent him a pair of moccasins, beautifully wrought after the most approved Indian style, as a present. After Mr. BLODGETT was settled in Hounsfield, he saw a young Indian, who introduced himself as HENDRICK's son, saying "me know you; you come to Oneida to sell powder; me little boy then; see you great many times; HENDRICK my father." In the Spring of 1801, he came here with SAMUEL BATES, (Col. BATES' father) and purchased 200 acres of land, in the town of Hounsfield, at $3 per acre, and made a little improvement preparatory to moving his family, such as putting up a little log house and chopping about 3 acres of the timber around it. Mr. BATES worked with him, and they kept bachelor's hall—cooking their own food, with the exception of bread-making, which was done by a family in the vicinity—Mr. WADLEY's—with whom they had a kind of arrangement by which they were entitled to rendezvous for headquarters at their house when not at work. They returned to their families to winter, but in the Spring of 1820 they came on again, and Mr. BLODGETT brought his family and such household goods as were indispensible, his kit of carpenter tools, and such seeds as he supposed would be useful, even providing a supply of the seeds of the common strawberry. His family consisted of his wife and one child (CALEB) and they, together with the stock of moveables, made out a load for a pair of horses and sleigh. Mr. BATES accompanied them again, though he left his family yet another year among their kindred in the "fatherland." In 1803 he commenced building a framed house, hewing all the studs and braces, as well as the larger timber, procuring his boards at DAVID SMITH's mill, at Adams village. He used inch boards, which were ship-lapped, for the purpose, and then the joints covered on the inside with strips of old newspapers, to keep out the air. He did not clap-board until 1812. The building is still standing and doing service as a stable for cows. There was a weekly mail, carried by Mr. AMASA HERRICK (afterwards Deacon HERRICK) on horseback, once a week, and as Mr. BLOOGETT's house was some 30 or 40 rods from the mail box, it was arranged so that Mr. HERRICK could leave the paper in the top of a tall stake which was provided by Mr. BLODGETT, with a split in the top, into which the paper could be deposited without making it necessary for Mr. HERRICK to dismount at all. He had an arrangement with the neighborhood by which his horse-team were made available to him in doing the milling for a large number of families at the mills of DAVID SMITH, of Adams, a distance of about 9 miles, he taking 1/2 of what remained of the grist after the miller had tolled it for his pay. They had one com, which got her living in the Summer season in the great wilderness surrounding them; which supplied them with an abundance of milk and butter and in 1804 Mrs. BLODGETT made her first cheese. Mr. BLODGETT worked sometimes at his trade, as a carpenter and joiner, for the people of his neighborhood, not on the "10 hour" principle, as is the custom, "according to law," now-a-days but from daylight till dark, then groped his way home to his family guided by the well-known sound of the bell on his cow, as she swung it to and fro in her vain efforts to keep off the mosquitoes. By these habits of industry, as well as the most rigid economy, that they soon found themselves surrounded by all the comforts of life, and in possession of a large real estate, consisting of more than 600 acres. I wish some locomotion, whate'er the force might be would put you in the notion to raise some cash for me no Erin bard e'er toiled so hard to please his honey as I, your friend, who now do send to get some money. I would not sue, a friend like you, if I could dodge it. But still remain, your very same, old friend BLODGETT. He was very fond of experimenting with crops of various kinds—keeping a journal or diary of his efforts, together with a daily statement of the weather, course of the wind etc. He introduced new varieties of potatoes by raising them from the seed called the potato ball. He paid considerable attention to the cultivation of apples, from which he made large quantities of cider, which was a source of profit. And also paid special attention to the raising of bees, producing an abundance of honey for the use of his family, and for sale in market, as a means of raising money. He had a propensity to "hunt" for the wild game which abounded in these great forests, he kept himself supplied with suitable implement of the art, such as a reliable "kill deer" (gun) and ammunition, and an assortment of traps, adapted to the different kinds of game. The depredations of voracious wolves upon our sheepfolds, was sometimes so annoying that the people were compelled to form combinations against them, of all the "settlers" in the "clearing," with the view of waging a war of extermination against the entire species, and most of the towns offered rewards in money, to be paid to any person who could satisfy the proper legal officer of the fact of killing one these dreaded animals. Thus, in Hounsfield, as early as 1806, it was resolved, "that the inhabitants who shall hunt any wolf or panther in this town (though he should kill such wolf or panther in any other town) shall be entitled to $10 bounty." This wolf and panther bounty was continued regularly until 1816, and a bounty of 50 cents was given for every fox which should be killed in the town, by inhabitants, in the years—1822-1823 and 1831. And then there was the common black bear of the country, whose propensity for pork and green corn was such, that it became necessary to "circumvent the varmints" by all the arts of which the "settlement" were possessed, not only punishing them for acts of commission, but anticipating their evil inclinations and indicting them as "accessories before the fact." But he was passionately fond of books, and devoted his leisure to reading every thing that came in his way—books of sciences, arts, history, biography and political economy—besides reading the Bible through five several times by course. He was considered particularly well posted in the value of farming lands, with their appendages, and was for that reason chosen as one of the town assessors for 20 years. Of course, he became intimately as well as critically acquainted with the great farming interests of the town, as a whole, as well as of each individual member of the body corporate. He was also one of the commissioners of common schools for a number of years, and took a deep interest in the success of our excellent system of education; and at his death he willed a small bit of land to the trustees of his school district, in trust, which has since been sold and the money permanently invested, drawing $70 a year interest, which is applied to the payment of teachers wages. In 1824 he built a model barn, which was christened the Farmer's Example, and which, to all observers, seemed likely to go down to future generations. So also with the care of young trees and forest timber—everything was done as with an eye to the benefit of posterity, and with the expectation that what he saved would be wanted. He willed his large landed property to his large family, so that each of them was left with a snug little farm, and died the 15th day of July, 1845 respected and lamented by all who knew him. This article can be found reproduced on pages 242-247 in "Links In the Chain by Solon Massey, 1850-1859," written by Junia Fitch Stanton, published in Watertown, New York, 1981.